Posted by makingyourdashcount in death, faith, Life Journey, mourning, movies, Sarah, space. We settled in the IMAX seating. The screen at the AMC was smaller than the screen at our local science museum, COSI, so I was a bit disappointed in that. For the most part the movie was gripping. The 3D effects were natural; it was nice not having contrived images to make wearing ridiculous glasses bearable. You don’t need corny effects for space. The plot was a bit contrived, but.. it’s a space disaster movie, so …whatever. Sometimes it nice to suspend reality and let the vines grow around the movie theater seat. So suspended we were, through the action scenes involving rogue satellite parts and shattering spacecraft. The scientist that my husband is exclaimed that Bullock’s character better hold onto something when she reached for the fire extinguisher the first time! We were suspended. And then Sandra Bullock’s character, Ryan Stone, started talking about her 4 year old daughter who died unexpectedly in an accident. I can’t quote the lines exactly ( or at all) but she talked about her daughter’s tangle of hair, a tangle that a brush couldn’t go through. At that point, I looked at John and saw his emotion. Our daughter, Sarah, whom we lost at 16 quite unexpectedly, had a tangle of hair that even at 16 she frequently gave up on! Then Stone’s daughter’s name, Sarah, was uttered. My husband and I held hands through the rest of that scene, as one. It was unexpected and (unfortunately) took us out of suspended reality because we identified with this mom. We knew Sarah. We knew where Ryan Stone was, because in so many ways, we are there, too. Loss of a child is sometimes treated sappily in movies and on TV. but this was really spot on. I identified with Stone wanting to believe in heaven, who wouldn’t? But Stone suspended her own secular humanist reality by wanting that for her daughter- a point that was interesting in a movie with so much religious imagery. In so many ways we connected with this character. Our empathy was with Stone; our tears were for our Sarah. I’ve read some critiques that the movie Gravity is really a chic flick in spacesuits. Perhaps. I would prefer to think that it’s an action flick with some humanity. All in all, it was a good night out. Was it worth $16/ each? It is “just a movie,” but it really was a fast paced 90 minutes that really should be seen in 3-D. Read the reviews and decide for yourselves. I am glad that we went. I mean, it is Sandra Bullock. Oh yeah, George Clooney’s in it, too. Posted by makingyourdashcount in Air Force, Life Journey, Mankato, memorials, Thoughts, Uncategorized. My father in law, Kenneth William Frederick Krause, died last week at 87 and was buried on Friday. For whatever reason there was no eulogy read at his funeral. No one spoke about Kenneth the man. However, of all the people I have ever known in my life, I feel as though his life is one of the most deserving to be celebrated. Consider this entry a daughter in law’s loving last gift to a father in law she cared for dearly. If you happen upon this and you knew Ken Krause, please add your thoughts and musings. After reading my father in laws obituary, one of my friends asked: He was very Christian, very military and very republican, how did John EVER bring you home? This statement made me laugh, because on the surface, one could think that. But what the obituary did not mention is what a loving, accepting and giving person my father in law was. He never wore his religion on his shirtsleeve; he lived it. He had a quiet faith that helped him through difficult things in his life and trust me he had his fair share. He was shot down over Burma in WWII, he nursed John’s mother through sickness before losing her to cancer, and he held my mother in law’s hand over the past many years as she has battled multiple melanoma. Through their health challenges and his he kept a quiet faith in God (and their doctors.) He never thrust his religion upon me or his grandchildren. Instead he embraced our lifecycle events joining us in them when he could. I never felt that he had anything but respect for the religion we followed; I think he just saw it as one different from his own: not better, not worse, just different. Kenneth Krause loved life and lived it to the fullest. A self made man whose highest degree was a high school diploma, one of his greatest prides in life was that both of his sons hold graduate degrees. Even with many of his own, he was proudest of his sons’ achievements. He was instrumental in everything aviation in Mankato, MN from serving on the airport commission to mentoring dozens of young men through participation in the Civil Air Patrol. He was a member of CAP for 62 years, serving as Commander for several of those. I flew with him one time, not really realizing his experience with aircraft. As a young pilot in the Air Force, Kenneth flew C-47 cargo planes on a route known as “flying the hump.” He flew the treacherous 530 mile route through the Himalayas 72 times, a route that claimed 600 planes and 1,000 men. His plane was shot down and he was wounded on one of his passes through Burma. As he put it shortly before he died, it took one hour to fly in and 9 days to hike out. His tenure in the China Burma India war theater ended with a barrage of medals and honors He earned Distinguished Flying Crosses for service beyond the call of duty, four Bronze Stars and Air Medals, the Purple Heart, numerous theatre ribbons, and the Chinese Air Force Pilot Wings. I can’t even imagine what that must have been like. My husband, John, said that Kenneth didn’t really talk about his experiences in the war until John was an adult. And he did not dwell on them. I suppose that time is needed to temper many of the unseen wounds. So true. He was very active in Minnesota’s Republican Party; he bled republican. Think about it. It surely takes a man of conviction and tough skin to be as republican as my father in law was, in Minnesota! 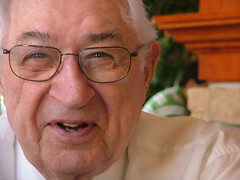 He worked as the campaign manager for Sal Frederick, Minnesota State Senator, who subsequently became a lifelong friend. Ken Krause became friends with just about everyone he met. He regularly met old friends for coffee. In fact, one of his local longtime haunts, The Wagon Wheel Café, sent along a coffee cup to the funeral. Friends told us of practical jokes and good natured fun. He also took great pride in never missing Rotary meetings. Rotary was a huge part of his life and his many friendships. If he had any regrets in life it would be that neither of his sons are pilots and neither are in Rotary. He gained so much through the relationships grown there; he felt that his sons were missing out on a huge life opportunity. There is no question that Kenneth Krause was loyal to the friends fortunate enough to have him in their lives. He was loyal to Standard Oil, his long time employer, which then became Amoco which was then purchased by BP. No other gasoline went into his lifetime of Fords and Lincolns. When Kenneth Krause believed in something or someone, there was no standing in his way. But through it all, he always kept a sharp wit. Even in his final days, Ken made fun of my political beliefs with humor and filled the room with stories and jokes. From the time I first met him, my father in law felt bigger than life to me. He has left his mark on my heart and the hearts of his many grandchildren. He will be missed.